let's talk about writing: leftovers, anyone? Disgusting, right? 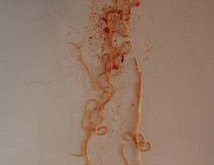 Far more easier to tolerate when the noodles you throw at the wall haven't been steeped in sauce. In the world of selling writing, strategizing a home for your pages, then following that up with cover letters and evidence and sparkling opening paragraphs is a bit more complex than hurling pasta against the wall, but the outcome is the same. If it's done, it sticks; if it's not, it slides to the floor. But the "doneness," well, the criteria for that involves many more factors than the level of durum saturation. First and foremost is a keen sense of who your audience is...what they're reading, what they can't put down. You have to play to that. If everyone's on the South Beach Diet, your pasta's going to wind up in your basement, under your Rubbermaid tub of teenage diaries and art projects. Hypothetically speaking. The market is fickle. More fickle than ever. Tastes have changed, but the impulse to get lost in story has not. The same themes that have always tantalize, continue to do so. I wrote a novel several years ago. The character was wrestling with mortality, and the decision whether or not to bear a child. It was birth:death, death:birth, side-by-each, with other Maslow's hierarchy considerations sprinkled about for good measure. The novel remains unpublished, but recently, whilst cleaning the funnel webs from my basement, there it was! A dampened, mildew-infested manuscript daring me to open it up and re-engage. Oddly, upon reading, I wasn't disgusted. It was relatively serviceable spaghetti, there on the page. Ingestible, even. I've decided to throw it against a few more walls before tossing it into the dumpster entirely. As a timeless, nourishing read, it deserves at least that.